Computer Cable Store™ Wire Marker Dispenser. Each dispenser contains 10 rolls of marker tape, numbered 0-9. 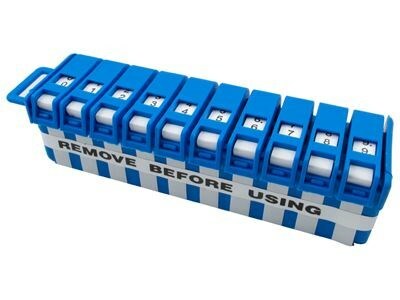 Each roll contains 76 individual markers with a pre-cut length of 1-1/4"", providing a total of 760 markers per dispenser in a convenient size to accommodate most commonly identified wire sizes. Each individual marker is mounted on a silicone release liner and has an acrylic adhesive, which is resistant to oil and water, and has a usable temperature range of -40 degreeF to +250 degreeF. The marker itself is made of Tyvek to assure durability and minimize the potential of tearing during application.